Home Theater is a great way to duplicate the movie theater going experience at home, but for many, the idea of setting up a home theater system is intimidating, but it doesn't have to be. Here is a way to get started. A disc player compatible with one or more of the following: Ultra HD Discs, Blu-ray Discs, DVDs, CDs. Connection cables and speaker wire. To familiarize yourself Home Theater Connector/Connections Gallery. Think of source components, such as a satellite/cable box, media streamer, Blu-ray Disc or DVD player, as the beginning point, and your TV and loudspeakers as your endpoint. You have to get the video signal from your source component to your TV, video display, or projector, and the audio signal to your loudspeakers. In a basic setup, you might have a TV, AV receiver, Blu-ray Disc or DVD player, media streamer, and possibly a VCR (or DVD recorder). In addition, you will need at least five speakers and a subwoofer. Below are examples of how to connect them together. However, keep in mind that there are several variations which would be dictated by the capabilities and connections available on the specific components being used. This is the centerpiece of a home theater. The receiver provides most of the source connectivity and switching, as well as all of the audio decoding, processing, and amplification to power your speakers. 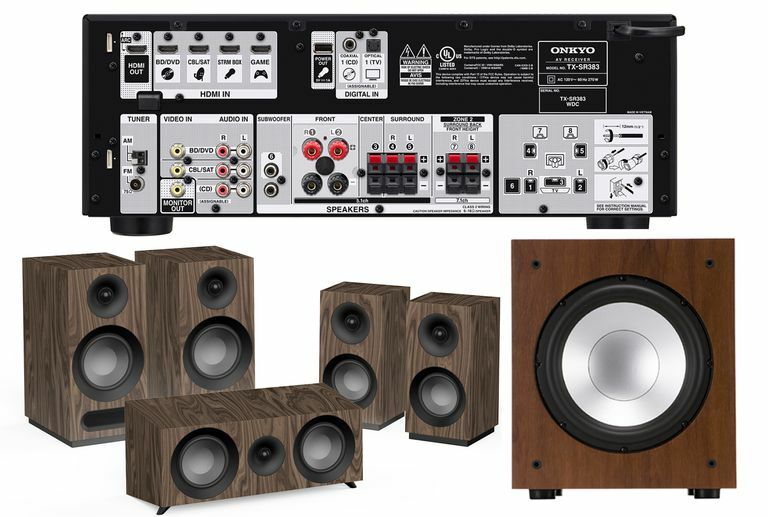 The rest of your audio and video components are usually connected to the home theater receiver. Sending Video from the Home Theater Receiver to TV - Connect the TV monitor output (preferably HDMI) of the AV receiver to one of the video inputs (preferably HDMI) on your TV. This allows you to view the video image from all the video source devices connected your home theater receiver on your TV screen. The AV receiver needs to be on and the correct source input selected, with your TV switched to the video input (not channel 3 or another channel) in order to view the video feed from your home theater receiver on your TV screen. Sending Audio from the TV to Home Theater - One way to get sound from a TV to a home theater is to connect the audio outputs of the TV (if it has them) to the TV or Aux audio inputs on your AV receiver. Another way is to use Audio Return Channel (HDMI-ARC) if both your TV and receiver have this feature. Either method will allow you to watch any sources connected directly to the TV and hear stereo or surround sound audio from programs that have it, through your home theater system. If you receive TV programs via antenna, connect that antenna directly to your TV. If you have a Smart TV, make sure it is also connected to the internet. If you receive your programming via a cable or satellite box, connect the incoming cable to the box. However, you have two options to connect your cable/satellite box to the TV and the rest of your system. One option is to connect the audio/video output of your box directly to your TV. The other option is to connect the box to your home theater receiver, which can also route the signal to your TV. If you are planning on using a video projector instead of a TV, the setup procedure is different. For a Blu-ray Disc player, the connection setup will depend on whether your home theater receiver has HDMI connections, and whether your receiver can access both the audio and video signals going through those connections. If so, connect the HDMI output from the player to the receiver and from the receiver to your TV. If your receiver only offers HDMI pass-through, then you may have to make an additional digital audio (optical or coaxial), or analog audio connection between the player and the receiver in order to access audio from the player. More on Blu-ray Disc player connectivity: Configuring Blu-ray Disc Player Video and Audio Outputs With Your Home Theater, Five Ways to Access Audio from a Blu-ray Disc Player and Connecting a 3D Blu-ray Disc Player to a Non-3D Compatible Home Theater Receiver. For a DVD player, connect one of the video outputs of the player to the DVD video input on the AV Receiver. If your DVD player has an HDMI output, use that option, the same way as you would a Blu-ray Disc player. If your DVD player does not have an HDMI output, use one of the other available video outputs (such as component video) in combination with a digital optical/coaxial cable from the player to your AV receiver. In order to access digital surround sound, use an HDMI or digital optical/coaxial connection. To connect a CD-only player to your AV receiver, use either the player's analog or digital audio outputs. If you have a CD-Recorder, connect it to your AV receiver through the Audio Tape Record/Playback input/output loop connections (if that option is available). If you have a media streamer, such as a Roku, Amazon Fire TV stick or box, or Google Chromecast, make sure it is connected to the internet, usually via WiFi. To view streaming content from these devices on your TV you can connect the streamer to your TV directly or route it through the home theater receiver - using HDMI in both cases. However, it might be best to go through the home theater receiver for the best combination of video and audio quality. Although VCR production has been discontinued and both DVD recorder/VCR combos and DVD recorders are now very rare, there are still a lot of consumers that own and use them. If you are one that does, here are some additional tips on how to integrate those devices into your home theater setup. Connect the audio and video outputs of your VCR or DVD Recorder to your home theater receiver's VCR video inputs (if you have both a VCR and DVD recorder, use the AV receiver's VCR1 connections for the VCR and VCR2 connections for the DVD recorder). If your home theater does not have inputs specially labeled for a VCR or DVD recorder, any set of analog video inputs will do, and if your DVD recorder has an HDMI output, use that option to connect your DVD recorder to your home theater receiver. You also have the option of connecting either your VCR or DVD recorder directly to your TV and then let the TV pass the audio to your home theater receiver. To complete your home theater setup, you need to connect the speakers and subwoofer and place them correctly. Connect your speakers up to the AV receiver. Pay attention to the correct polarity (positive and negative - red and black) and, make sure the speakers are connected to the correct channel. Connect the subwoofer line output of the AV receiver to your subwoofer. Position your loudspeakers but do not place them flush against walls, they should be set away from the wall, the amount of optimum distance away from the wall surface may vary. To further aid in your speaker setup, take advantage of the built-in test tone generator and/or automatic speaker setup, or room correction system if it is provided on your receiver to set your sound levels. An inexpensive sound meter can also help with this task. Even if your receiver has an automatic speaker setup or room correction system, having a sound meter on hand to allow further manual tweaking of your speaker levels is a good idea. All Speakers should be able to output the same volume level. The following examples are for a typical square or slightly rectangular room. You may need to adjust your placement for other room shapes and additional acoustical factors. A home theater setup utilizing 5.1 channels is the most commonly used. For this, you need 5 speakers (left, center, right, left surround, right surround) plus a subwoofer. Here is how they should be placed. Front Center Channel - Place directly in front, either above or below the television. Subwoofer - Place to the left or right of the television. Left and Right Main/Front speakers - Place equidistant from the center speaker, about a 30-degree angle from the center channel. Surround speakers -- Place to the left and right side, just to the side or slightly behind the listening position - about 90-110 degrees from the center channel. These speakers can be elevated above the listener. The Front Center and Left/Right Main speakers and Subwoofer are the same as a 5.1 channel setup. Left/Right Surround speakers - Place to the left and right side of the listening position. Rear/Back Surround speakers - Behind the listening position—slightly to the left and right (may be elevated above listener)—place at about 140-150 degrees from the Front Center channel speaker. The speakers for the surround channels can be elevated above the listening position. For more speaker setup and placement options, check out our companion article: How Do I Position Loudspeakers For My Home Theater System? The above descriptions are examples of some options on how to set up a home theater system. The extent, combinations, and connection options vary depending on how many and what types of components you have, as well as your room size, shape, and acoustical properties. Read the owner's manual and illustrations for all your components that outline your connection and setting options. Have the correct audio, video, and loudspeaker connection cables, and at the right lengths. If you don't have all the needed cables, don't panic, you just might need to make an extra trip to Best Buy or Fry's; it happens to all of us at some point during the setup procedure. As you go through the connection process, consider using a label printer so that your cables and wires can be easily identified later if you need to make connection changes. The THX Home Theater Tune-Up App provides an easy way to check your initial TV or video projector picture settings and make sure that your speakers are connected correctly. For additional advanced tips on home theater setup, check out our companion articles: Five Ways To Get Best Performance From Your Stereo System, Bi-Wiring and Bi-Amplifying Stereo Speakers, Improve The Sound Quality of Your Listening Room, How Room Lighting Affects TV Viewing. If the task becomes overwhelming and nothing seems to be "right", there are some initial troubleshooting tips you can take advantage of. If that fails to solve the problem(s), don't hesitate to pay someone (such as an installer that subcontracts with your local dealer) to do it for you. You will get a system set up quickly and working properly. This can be money well spent.